Aragonite is a usually white, yellowish, or pink orthorhombic mineral that can occur in many different colors. It is a polymorph of calcite, with chemical formula: CaCO3. Aragonite occurs as acicular (needlelike) or tabular crystals, or as fibrous aggregates. It is found in gypsum deposits, at the tips of calcite crystals, in mollusk shells and pearls, and in living reef structures. It is formed by biological and physical processes, including precipitation from marine and freshwater environments. 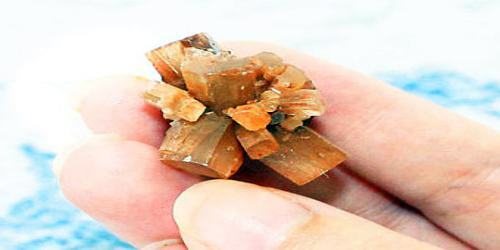 Most large Aragonite crystals are twinned growths of three individual crystals that form pseudohexagonal Trillings. Although Aragonite crystallizes in the orthorhombic system, most prismatic crystals are hexagonally shaped due to the twinning. Trillings can be identified by their multi-directional basal striations from each individual member crystal. 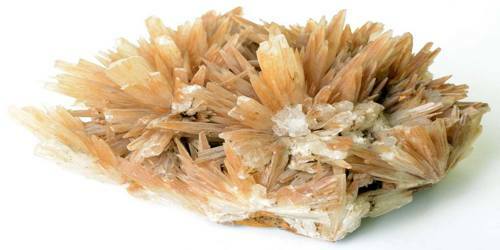 Aragonite was named by Abrahan Gottlieb Werner after Molina de Aragón, Spain, the type locality where this mineral was first described. 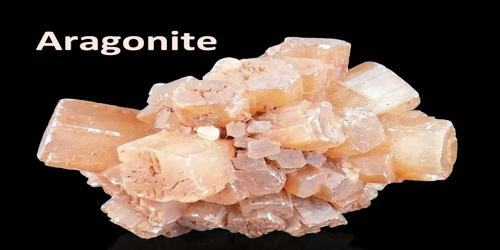 Aragonite is always found in deposits formed at low temperatures near the surface of the Earth, as in caves as stalactites, in the oxidized zone of ore minerals with lead substituting for calcium, in serpentine and other basic rocks, in sediments, and in iron-ore deposits. It is the mineral normally found in pearls. It is polymorphous (same chemical formula but different crystal structure) with calcite and vaterite, and, with geologic time, probably inverts to calcite even under normal conditions. Aragonite has come from Austria in a Siderite mine in Eisenerz, Styria (mainly in the Flos Ferri variety), and in the salt mines of Salzburg. The old iron mines at Frizington, Cumbria, England; as well as the locality of Vitosov, Moravia, Czech Republic; have both been good specimen producers. A recent producer of specimen-grade Aragonite is Liupanshui, Guizhou Province, China. One of the most prolific occurrences for this mineral, in large Trillings and in aggregates of reddish-brown crystals, is the Tazouta Mine near Sefrou, Morocco. Aragonite is metastable at the low pressures near the Earth’s surface and is thus commonly replaced by calcite in fossils. Aragonite older than the Carboniferous is essentially unknown. It can also be synthesized by adding a calcium chloride solution to a sodium carbonate solution at temperatures above 60 °C (140 °F) or in water-ethanol mixtures at ambient temperatures. 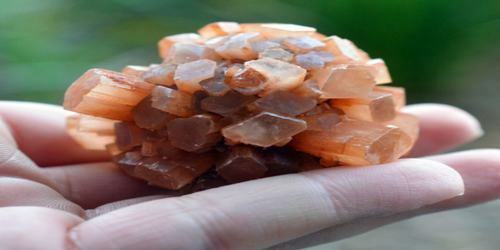 Aragonite is the main component of many organic substances, such as pearl and coral. The iridescent surface of Pearl and mother-of-pearl is actually a layer of Aragonite secreted by mollusks and related invertebrates. Some forms of Aragonite, especially the Flos Ferri variety, are brittle and very fragile, and may easily break when touched. Such specimens need to be much care. Aragonite is thermodynamically unstable at standard temperature and pressure, and tends to alter to calcite on scales of 107 to 108 years. The mineral vaterite, also known as μ-CaCO3, is another phase of calcium carbonate that is metastable at ambient conditions typical of Earth’s surface, and decomposes even more readily than aragonite. The most prevalent crystallized habit is pseudohexagonal Trillings, in the form of elongated prismatic crystals or short tabular ones. Less commonly in individual, untwinned crystals. Many aggregates exist, including acicular, radiating, fibrous, columnar, stalactitic, botryoidal, pisolitic, oolitic, tuberose, granular, encrusting, and ball-like protrusions of pseudohexagonal crystals. Aragonite is an important element in the shells and tests of many marine invertebrates. These animals can secrete the mineral from waters that would ordinarily yield only calcite; they do so by physiological mechanisms those are not fully understood. 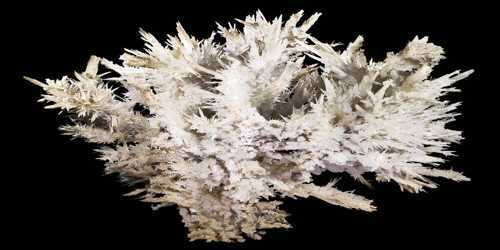 Aragonite does not have many practical uses, although interesting specimens are popular collector minerals. “Onyx Marble” formed from mineral springs is sometimes carved into ornamental objects.